Sunday 8:30am (8:45am on water), Tuesday and Thursday evenings at 5.30pm (5:45pm on water). – When paddling wear clothes that can get wet – generally shorts or wet suit pants, rash shirt or Tshirt. Some paddlers wear paddling gloves and paddling shoes. To protect your feet, footwear with non slip rubber soles that you can swim in are recommended. Bring a water bottle. – On colder nights wear a rash shirt or wetsuit top. Do not wear heavy clothes, ie jumper or track pants that will absorb water and will be hard to swim in. – Dragon boating is a water sport, and you will get wet, so it is recommend that you always bring a towel, some dry clothes and shoes to put on after training. It is recommended that you pack your bag the day before with drinking water, a towel, dry shoes and a change of clothes etc. and take these to work with you. The focus of our coaching staff is to improve the baseline fitness and strengths of all members. The club believes in quality time on the water with an emphasis on replication of racing situations. We encourage paddlers to undertake other sports and exercise in between training days in order to improve fitness levels. This additional exercise will greatly assist with improving your capacity to paddle. 3. For those people who play “running” winter sports, or have leg injuries that do not allow playing of a running sport, it allows them to maintain and improve fitness without the stress and duress upon their legs and hips. Please advise the coaching staff if your have any injuries or health issues that will affect your paddling performance or where you can sit in the boat. We aim to keep everyone safe and free from injury. The coaching team will develop a variety of training routines that help to condition and strengthen your body as well as improving your technical ability to paddle efficiently, and really importantly, work as a team. The routines will vary throughout the season depending upon which training phase we are in and when our next competition is. 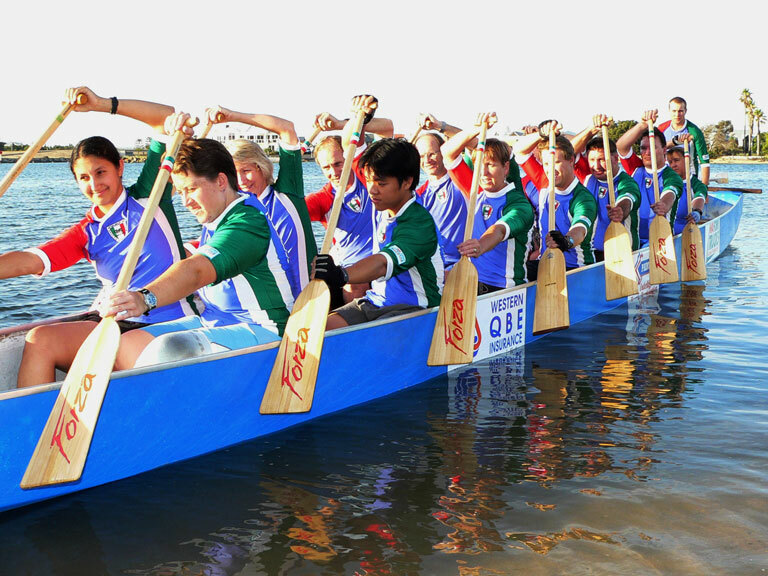 Important components of dragon boating is team work, technique and fitness – things that we can all improve on. The information below is supplied by Rebecca Bonetti who came to Forza from New Zealand. Rebecca brings to Forza her experience, qualifications and background in fitness, personal training, physical education, and work with elite sports people at the New Zealand Academy of Sport. There are many reasons why people are involved in sports and while FORZA Dragon Boat Club has a strong social component, training sessions and racing are becoming more intense as the season progresses. This increase in intensity means that some of us may be feeling we could do a little more outside of scheduled training sessions to help us make the second part of the season more rewarding. Firstly, trying to make all scheduled training sessions each week is by far the best way to keep up with the play, especially if you are planning to race. Secondly, if you can add a training session to your week to compliment on-water training it will help, and to get the most benefit, the additional exercise needs to be as specific as possible to Dragon Boating. Dragon Boating is a power sport but also requires base aerobic fitness. Concentrating on strength and power training will be beneficial, preceded by an aerobic warm up. This means these sessions need not be long and can probably be completed effectively in a half hour to 45 minute time slot. These sessions can mirror our training on the water– warm up, speed work, interval work, strength work and a warm down. The warm up can also provide the aerobic component to your training. Try to increase the time of the continuous aerobic exercise each time you go out. Eg. If you can paddle, row, swim or jog for 5 minutes continuously now, try adding 1 minute to the activity each time until you can perform 15 minutes without stopping. The best day to add supplementary sessions would be a Wednesday or a Monday (except race days!) to allow for 2 days recovery before the most intense days of the week. OPTIONS If you don’t have access to equipment and your only options are cycling, running or walking, then this is better than nothing at all. Go for it – find a buddy to help you along – there may be someone else in the club who would like to join you. For breakfast on regatta day choose something high in fibre like porridge, muesli, Weet Bix, wholemeal or multigrain bread or baked beans. During the day snack on fruit, nuts or a sandwich – something light that will digest easily. Remember, the best fluid is water. Sports drinks are full of sugar and do not help with hydration.